Butterfinger — one of the brands acquired in Ferrero’s $2.8 billion acquisition of Nestle’s confections business last January — is touting an improved recipe with its largest campaign in over a decade. The nearly 100-year-old brand now uses a larger type of peanut and more cocoa and milk for a richer chocolate coating, and has eliminated hydrogenated oils and the preservative TBHQ. The bars, now at retailers across the country, also feature a brighter-yellow wrapper that’s double-layered to preserve freshness. Ferraro is supporting the major revamp with a “Better Butterfinger” campaign from lead creative agency Pubbliregia. The campaign features an ad being run across cable and network channels and social media, as well as a new website. 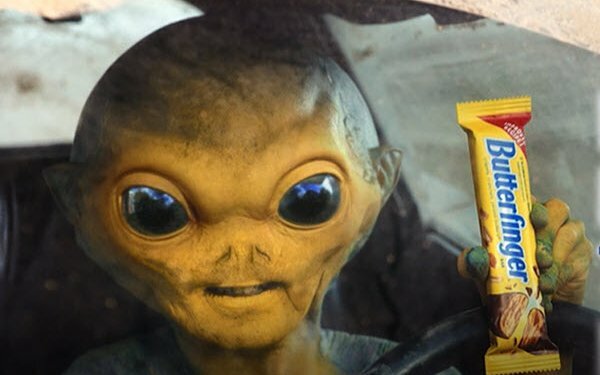 The ad (30-second version for TV; 60-second version below) introduces an alien character who comes out of a suspended state when he gets wind of the “better Butterfinger,” and goes on a tear in a sand-covered Camaro in a mission to take possession of one of the bars. Ferraro’s advertising push represents a doubling of what was spent on the brand in recent years, Kristen Mandel, senior director of marketing for Ferrero-owned Ferrera, told Business Insider. "The priority is really bringing Butterfinger back into the spotlight as a modern-day icon, because it hadn't gotten the attention it warrants in recent years," she said. Ferrero, the third-largest global confections company, entered the U.S. in 1969 with Tic Tac mints and subsequently introduced Ferrero Rocher hazelnut chocolates, Nutella hazelnut spread and Kinder Joy to the market. In 2017, it acquired Ferrara Candy Company, a U.S. maker of non-chocolate candy brands (Trolli, Brachs, Black Forest Organics).